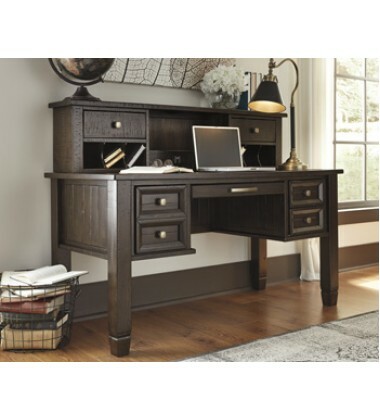 Cases and desk are constructed from Pine solids with a rough milled wood texture and a waxy grayed finish. Drawers are framed, have fully finished drawer boxes with ball bearing side glide and feature bar pulls or knobs in an aged pewter finish. Desk hutch features a AC power strip with USB charging port. Slat-back office chair has a textured cleanable light brown microfiber covered seat cushion. Office chair has adjustable tilt, swivel and adjustable height and casters for mobility. Large bookcase has adjustable shelves and adds vertical visual element and provides a vast amount of storage. Dimension(Inch) : L x D x H: 58.75" x 10" x 13.75"